Our popular Santa Sing-Along trains are back on the schedule this year with holiday cheer for all ages. Riders will hear the Night Before Christmas and Christmas music in anticipation of a visit from the man in red. 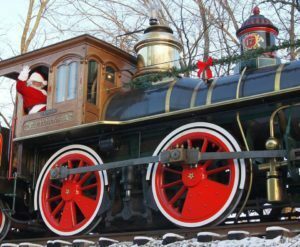 There will be a lot of excitement on the train as Santa boards the train and hands out a small gift to the children. You will be able to take pictures with Santa. There will be hot chocolate, cookies and music in the station prior to departure. Join us for these entertaining and fun rides. The coaches are pushed and pulled by the steam locomotive. This is an hour long excursion. Tickets will be printed and be available for pick up at the ticket booth on the day of the excursion. The 2018 Season of Imagination is brought to you in part by Bronze Sponsor, Aero Energy. Thank you for your support. Shop hours subject to change due to event schedules. Click here to see Schedule for train times.